In time of test, family is best. 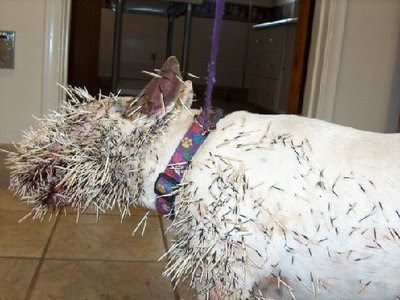 A Pit Bull from Southern California decided he would take on a Porcupine in his back yard...he ultimately learned the hard way that you can't always win no matter how tough you might be. 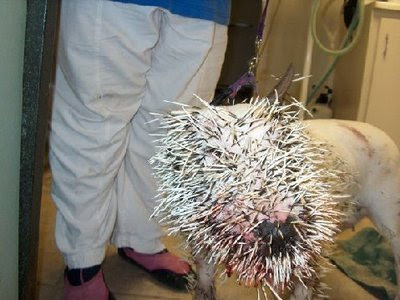 After the encounter, a vet sedated the dog and then removed 1,347 quills (!!!). The dog survived and hopefully learned a valuable lesson. yes I can see you page fairy,,its cute!! Beautiful Girl, Drama Queen, Big sister, Loves Attention!!! Loving Boy, Happy, Enjoys Learning, Loves to tease!!! Great Nephew, Always smiling, spoiled by all, Blessing to our family! Blogs We Love...of Family and Friends we Love!! I went really short this time! Add yourself to our map....even if we dont know you!!! How many people has visited our Blog?